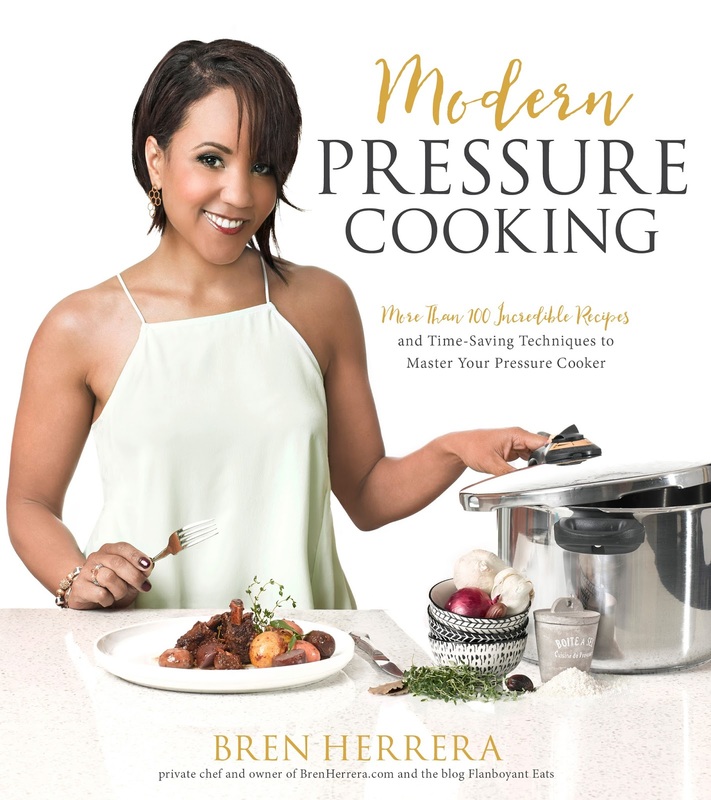 Modern Pressure Cooking by Bren Herrera, Page Street Publishing Co. 2016. I recall, when I was a child, Sunday's in my grandmother's kitchen. After morning church services we would come home and get changed then play until dinner time, which was mid-day so we would be ready to head back to evening church services. Because our day was scheduled so, there was one other thing I remember: this hiss and rattle of my grandmother's pressure cooker. Every week, without fail, she would make a chuck roast for dinner, and the only way to get that done in the time span we had was to pressure cook it. The meat was ever so tender and flavorful and it was something I looked forward to each time we visited. As an adult I didn't have a pressure cooker for many years. I was afraid of them, as many cooks are, and for a time I wasn't able to afford one, either. Once I settled in as a much older adult I was gifted an electric pressure cooker. I was hooked. With 9 mouths to feed daily and busy beyond all with school and life I found it to be my cooking savior. Meats were done in no time and dinner that tasted as if it had cooked hours was now ready in a fraction of the time. 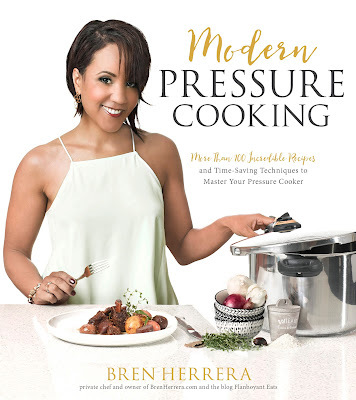 Sadly, the very day I received my copy of Bren Herrera's Modern Pressure Cooking (Page Street Publishing, 2016), my electric pressure cooker died. I decided after a mere year's worth of use that I wasn't going to make that mistake again and bought a trusty old 8 quart aluminum stove top pressure cooker. I'm already in love - and not just with the cooker! This book. Oh, my. If there is anything at all you want to know about pressure cookers, this is the book to buy. Bren covers everything from which types of cookers are available to all the methods of release there are to international, vintage and gadgets and gizmos for your cooker. After all that? The recipes, oh my. I made Bren's mother's Famous Cuban Black Beans (recipe below!) right off the bat and they are just to-die-for! I mean, beans from dry to delicious in 40 or so minutes? This is my kind of recipe. Once I had those beans done, I was hooked. I started throwing everything in that pot with Bren's beautiful book as a guide and created meal after beautiful meal in no time flat. Best You've Ever Had Braised Round Roast? YES. Herbed Chicken Stock? YES. (No more cooking for hours.) And flan? Oh, flan ... Bren is the QUEEN of flan and shares no less than 4 recipes for flan, and with a 13 to 17 minute cook time, what is not to LOVE? I feel a Braised Pulled Pork BBQ coming on this week, and after that I may just keep going until I've made every single recipe. So, get your own copy, please don't even question this! GO and get a copy at Amazon, Barnes & Noble, BAM!, IndieBound, or iBooks. You can also find more about Bren at House of Bren. Now, here is that beautiful recipe and photo, to boot! Black beans are Cuba’s most beloved food. They are pedestaled to glorious heights in Cuban homes around the world. You’ve seen and probably made a version of these “Cuban black beans” at some point in your Latin food exploits, but you’ve never made these. This is my late grandmother’s recipe as translated and perfected by my mother for over 40 years. Her beans are the point of query after reconnecting with childhood friends. They are the single food in my family that is still rationed. It’s the one dish that humbles my skill. I can make my mother’s beans, side by side with her, but hers will always exceed triumph. There’s something indiscernibly magical about her touch. I hold this recipe close to my heart, but have waited for over a decade to share it publicly. I hope you love them as much as everyone who’s ever eaten in Mami’s cocina. For your convenience and ease, this recipe does not require any soaking. Goya and Rancho Gordo dried beans are my go-to brands. 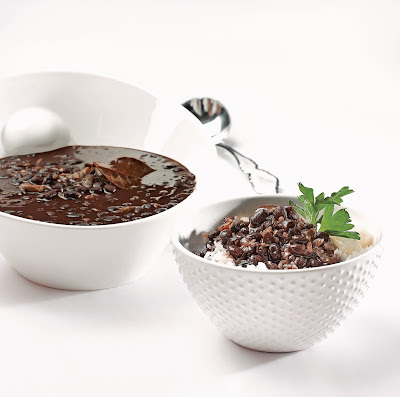 To enjoy a very classic experience, ladle about one cup (172 g) of black beans over fluffy white rice and serve with a side of sweet fried plantains. Heat the oil in the stovetop pressure cooker over high or use the sauté setting for the electric pressure cooker. Make the sofrito: Sauté all of the vegetables and garlic, with the oregano and cumin, until it is fragrant and the onion is translucent, about 4 minutes. Reduce the heat to low or cancel the sauté setting. Add all of the remaining ingredients, except the cooking wine and olive oil, to the cooker and stir to combine well. Close the lid. Stovetop: Set to high pressure (15 PSI) and set the timer for 35 minutes. Cook over high heat. When the pressure point is reached, reduce the heat to medium and continue to cook. Electric: Set to high pressure (10–12 PSI) and 40 minutes. When done, remove from the heat or turn off the cooker and allow the pressure to release on its own (natural-release) for 10 minutes, then apply auto-release. When all of the pressure is out, open the lid and top the beans with the cooking wine and drizzle in the olive oil. Allow the beans to rest a few minutes before serving. B’S COOKING TIP: If you soak the beans overnight, you can save up to 20 minutes with this recipe! Simply reduce your cooking time by 10–13 minutes. Also, these beans can last up to 1 week in the refrigerator and 4 months in the freezer. All photo and recipe credits to Bren Hererra, Page Street Publishing and Ken Goodman.